A chimney fireplace can add value to your home. From providing warmth in the colder months, to adding a decorative piece to the center of a room when not in use, when properly kept and maintained, your chimney fireplace will look good, and will be fully functional year round. So, consider these tips for cleaning and maintaining the area, if you do have a chimney fireplace installed in your home. With a chimney fireplace, keeping it clean is extremely important. From cleaning up debris after each use, to cleaning the inside walls of the chimney of soot and smoke, the cleaner the fireplace, the less likely an accident or threat of fire. Further, when it is clean, it is going to burn cleaner, and you won’t have to deal with the smell of burnt wood each time you decide to light up a fire in the chimney fireplace. Hiring a chimney sweep company to survey the chimney fireplace, inside and out, every six months is smart practice as well. Doing this allows them to check for smoke, soot, and potential debris from piling up on the walls of the fireplace. 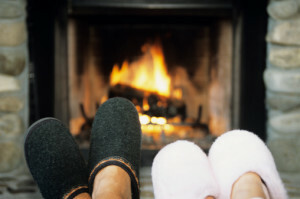 If there is an external connection, they can check the top of the chimney fireplace to ensure no animals, twigs, or other items have fallen into the fireplace. And, they can check the surrounding areas for mold, dirt, or other debris which might have clogged the exterior of the home. This is especially important if you live in colder areas, and do utilize the chimney fireplace often when it is cold out. Birds, rodents, leaves, twigs, and other debris can easily fall into your chimney fireplace. In some instances, small animals or rodents can get caught inside and die, which will cause horrible odors. Further, if debris fills the space, it is going to limit air flow, and won’t allow the chimney fireplace to properly circulate. All of this makes for fire hazards, hazard of smoke and soot inhalation, and unpleasant odors each time you choose to use the fireplace. Therefore, installing a cap to protect the top of the chimney fireplace, is a simple solution to prevent these issues, and is smart practice regardless of where you live. In addition to being the simple solution to the problem of items getting stuck in the chute, it is also one of the most affordable ways to protect your fireplace as well as the home. Whether you use it once a year, every weekend during the winter months, or simply have it as a centerpiece for decoration, your chimney fireplace has to be properly maintained year round. These simple practices will not only allow you to keep the chimney fireplace clean, but also odor free. Further, it is going to help prevent the dangers and potential damage which come along with smoke inhalation, and the potential risks of spark or fire, if your chimney fireplace is not properly maintained by the home owners.